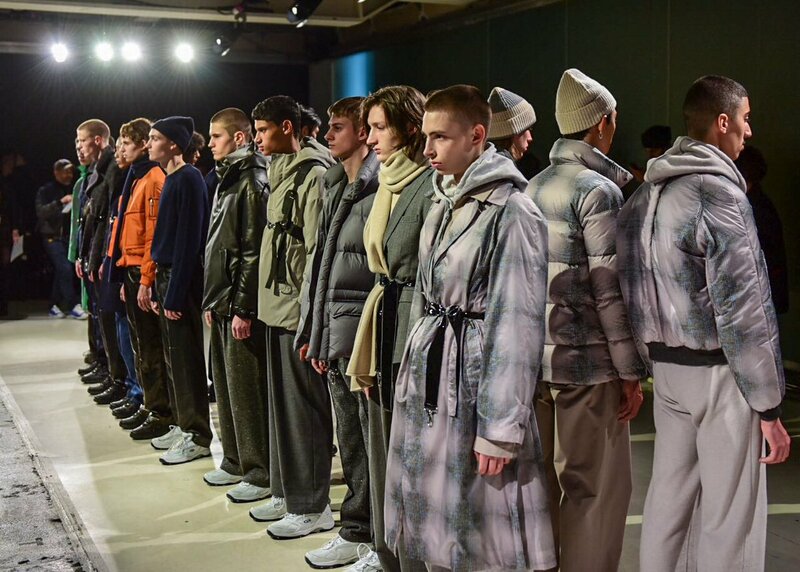 The day first of Men's London fashion week AW18 kicked off today, the key trend we spotted is very commercial, no more oversized styles and mostly minimal prints to watch this season. Edward Crutchley brings the Bold prints backstage ahead of the Edward Crutchley AW18 show, In fabric, The velvet trend is still going strong for this AW18. 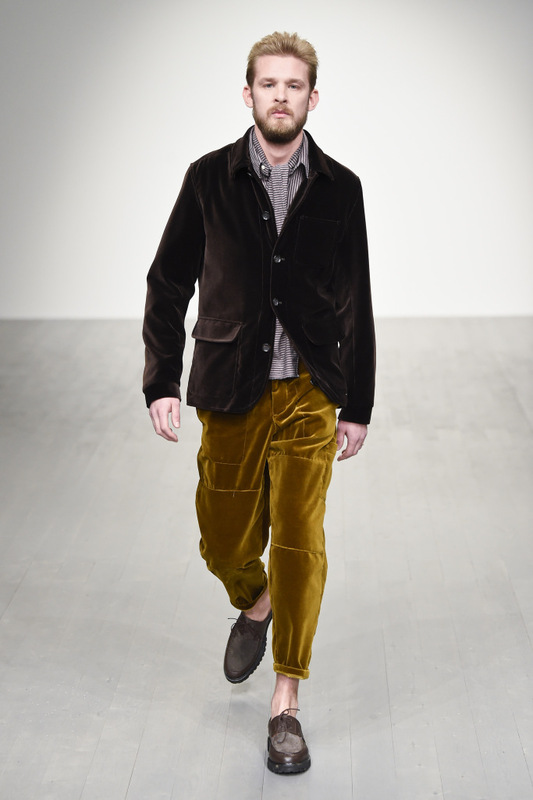 Seen at both John Lawrence Sullivan and Crutchley studio for the London fashion week Men. When we thought the dad trainer trend is out, think again, Orthopaedic sneakers were seen at both Crutchley studio and Tonsure. 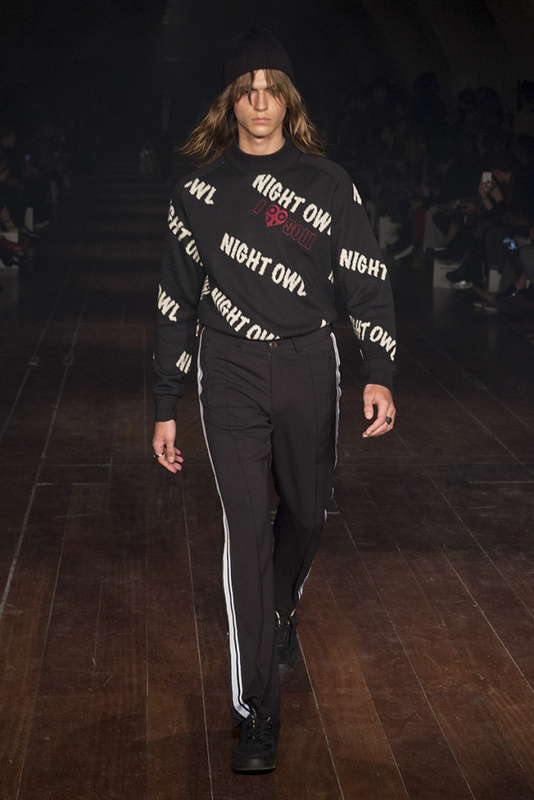 Wistful Stranger Thing vibes have seen at the WOOD-WOOD show, where trousers with blood strips and sporty separates met military styling. It looks like blood stripes are going to be big for AW18, seen at both Oliver Spencer and WOOD-WOOD. 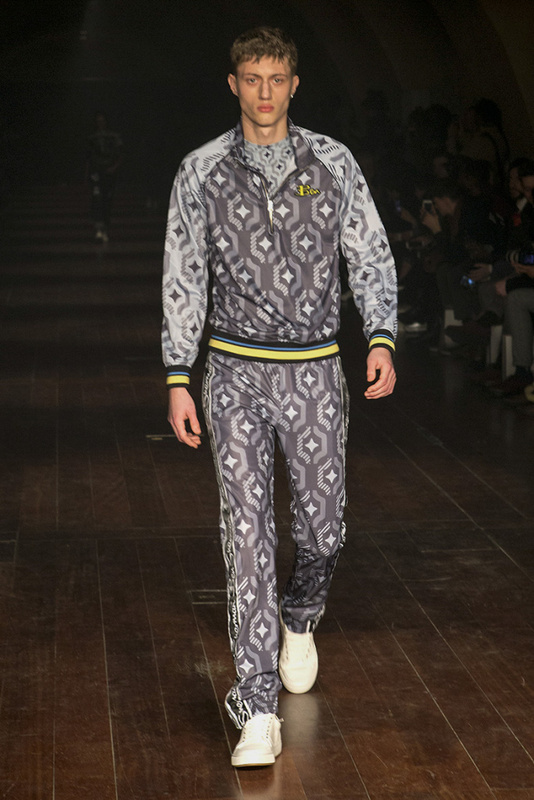 Ben Sherman's collection brings the sporty-formal to the AW18 collection, a sportier aesthetic to the brand in the form of technical tracksuits which featured all-over geometric prints and bold patterns. Holland also played with the brand’s logo, which ran down the legs of tracksuit joggers. This was done in bright primary colors for both men and women. 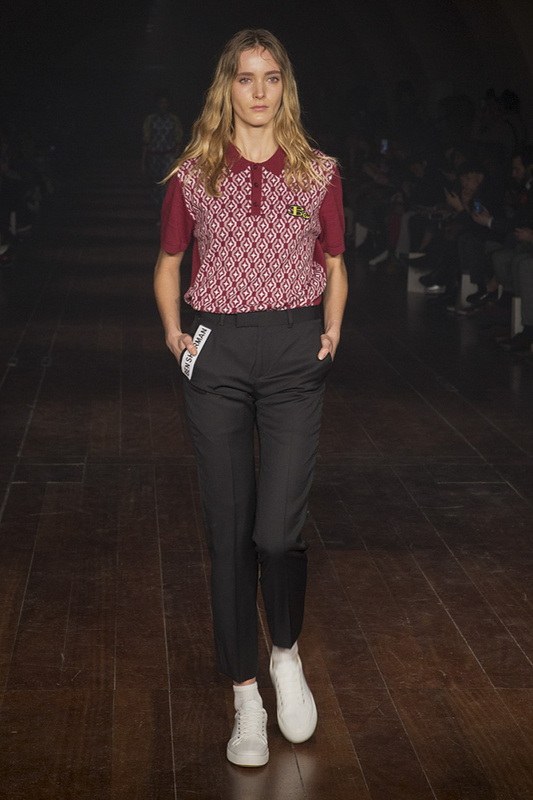 This show was filled with luscious fabrics, the key fabrics were velvet, corduroy and nubby wool check, whipped into slim-fitting workwear shapes that looked just as good on the women as they did on the men. 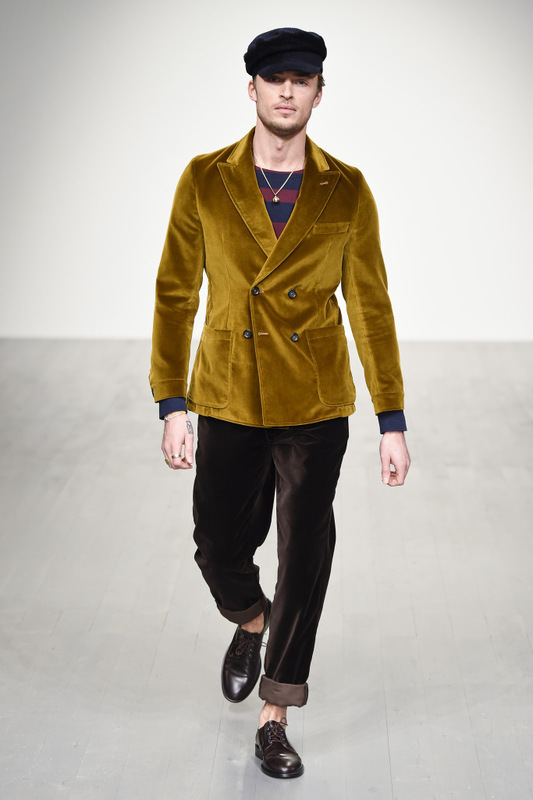 Velvet trousers with some rolled at the ankle; slim, tailored corduroy jackets, or lose turtlenecks in navy or rust with contrasting rectangles at the front. 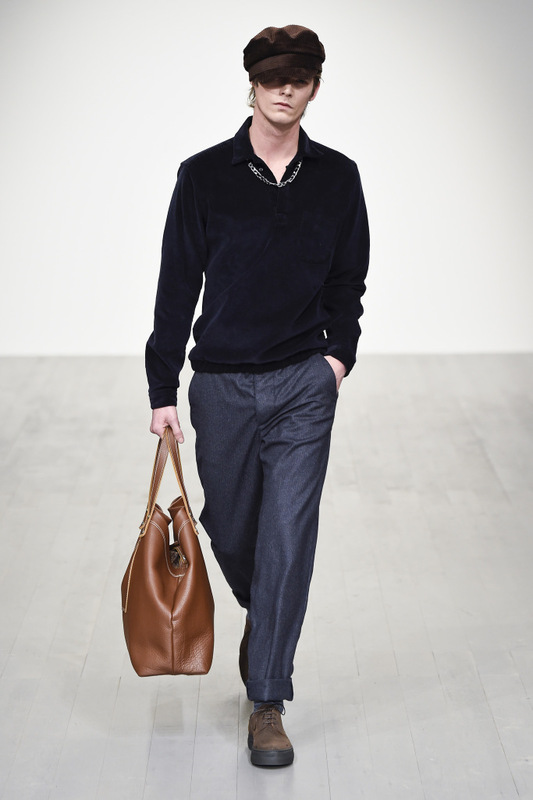 Suits spotted at the show were very casual in check wool jackets that had patch pockets and elasticized waists. Other, bomber style jackets were done in soft, toffee-colored leather, while long and slim checked wool toppers had fur-trimmed hoods.